If you look in my refrigerator on any given day, you’re sure to find fresh pesto. Everyone in my family loves it…even the kids! As easy as it is to make, I don’t know why anyone would buy it. Not to mention, jarred pesto is a completely different food in my opinion. It lacks freshness, which is what I love so much about it. 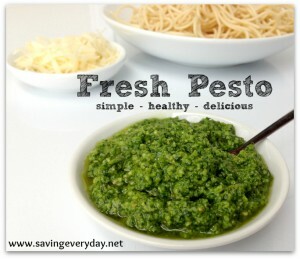 The most common way to eat pesto is on hot crusty bread or pasta. “Green spaghetti” is a favorite in our house, and is simply hot cooked pasta tossed with pesto and extra Parmesan – YUM!. I also use it as a seasoning. It’s delicious in soups, dips, and even sandwiches (it’s great on paninis). When my Thai Green Curry Chicken was missing something, I added a dollop of pesto, and it made the whole dish! This recipe is very budget friendly, coming in at less than $5! I buy my basil at the farmer’s marker or Trader Joe’s, so it’s very affordable. Fresh herbs can be pricey at grocery stores, so keep your eye on sales or check your farmer’s market. I can’t call this a classic pesto because I used cashews in place of pine nuts – and here’s why. Pine nuts can be pretty expensive, but they give a creamy richness to pesto that’s necessary. You’ll often see walnuts substituted for pine nuts, but I think the flavor is too strong and it alters the taste (and my husband is allergic). Cashews are also rich and creamy, so I thought they’d be a good substitution…and they were. You might notice three garlic cloves in the picture, but the recipe only calls for two. We love garlic, but three was too much. That said, once you taste it, you add more of whatever you like. Add the basil, garlic, cheese, and nuts to a food processor. Pulse until it's all chopped up and combined but not completely puréed. Turn the food processor on and drizzle in the olive oil, stopping and scraping down the sides a few times. Purée until it's the desired consistency. I like mine with some texture, and less oil, but if you prefer it to be more sauce-like, continue streaming in olive oil and puréeing until you're happy with it. Taste and adjust the salt and pepper to your liking.